In this interview with MPMN, William Fuller, director of business development at DSM Biomedical (Berkeley, CA) paints a picture of biomaterials' future in procedures such as total hip or knee replacement. Among the topics discussed here are hindered amine light stabilizer (HALS), which can be used in total hip, knee, shoulder, and ankle implants to stabilize ultra-high molecular weight polyethylene (UHMWPE). Fuller also touches on biomaterials that could be used to replace damaged cartilage and provides an overview of how future biomaterial breakthroughs will drive innovation in orthopedics. HALS technology can be used in any orthopedic application in which stabilization of UHMWPE is required. Fuller discusses the topic at length in an article titled "Next-Generation Stabilization: Improving Joint Implant Efficacy and Durability." MPMN: How do you think biomaterial breakthroughs will improve total hip or total knee arthroplasty procedures, both in the short and long term? William Fuller: The majority of total artificial joints use an UHMWPE as a bearing material. To improve the material's wear resistance, UHMWPE is cross-linked by means of gamma irradiation, decreasing the number of shed wear particles. When wear particles shed, it can trigger an inflammatory response in the surrounding implant, causing bone reabsorption and implant loosening. While crosslinking improves wear resistance, it comes at the cost of the oxidative stability of UHMWPE. This is caused primarily by highly reactive free radicals that are introduced during the crosslinking process, but can be mitigated by adding stabilizers (radical scavengers) to the UHMWPE. One of the first stabilizer products introduced to the market was vitamin E. There is currently a focus on the stabilization of UHMWPE using alternative stabilizers. DSM, for instance, has developed a proprietary HALS stabilizer product that better preserves the mechanical properties of UHMWPE. In addition, HALS is the only stabilizer that does not require companies to change their crosslinking processes, as is the case with processes that use vitamin E.
In the long-term, alternative materials may be used in the design of total artificial joints. Certain polyurethane materials have been shown to have low wear rates, and superior fracture resistance when compared to UHMWPE. The use of polyurethanes shifts artificial joints towards more compliant (softer) material interaction, which more closely resembles a natural joint where softer cartilage tissue interfaces with the bones in the joint. 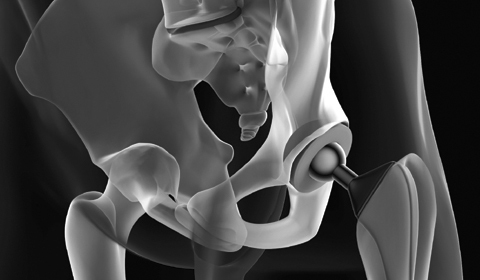 MPMN: Reimbursement for total joint replacement procedures is declining in the United States. How can biomaterial advances help bring the cost of the devices down? The Orthotec orthopedic conference and expo will be held once again in Warsaw, Indiana. Scheduled for June 5-6, the event will feature keynote presentations from orthopedic surgeon and inventor Kevin Stone, MD; ESPN chief medical correspondent Michael Kaplan, MD; and Stryker chairman Scott Bruder. Two half-day workshops will be held on June 4, dedicated to the topics of materials selection and testing and quality issues. Fuller: Because reimbursement is declining, there is a current focus on cost reduction. There is also a growing trend towards outcome-based reimbursement meaning that devices need to be both cost effective and provide superior outcomes. This is a huge challenge, as better technology does not typically come with a lower price tag. Certain polyurethane materials offer the possibility to address the cost pressure facing joint replacement devices. One reason is because they can be processed using injection-molding techniques, which is a much lower cost approach to manufacturing. The process of making UHMWPE into a device involves producing UH resin, compression molding the resin into large sheets and blocks, machining the components and finally crosslinking, which often requires annealing or re-melting to remove residual free radicals. It should be noted that a move from UHMWPE to polyurethane materials would require a paradigm shift as the use of UHMWPE in the design of total joint replacement devices has a track record that is decades in the making. Consequently, more incremental innovations such as the introduction of stabilizers to enhance implant durability are the next wave of innovation in this space. MPMN: What kind of biomaterial developments might be able to specifically address damaged cartilage? What about spinal procedures and bone grafts? 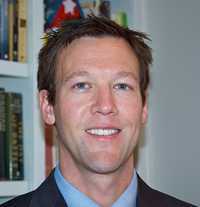 Bill Fuller is director of business development, orthopedic at DSM Biomedical (Berkeley, CA). Fuller: This is a very big and important question. With more than 25 million Americans suffering from some sort of osteoarthritis, treatment options are primarily focused on early intervention and reducing or delaying the need for total joint replacement. To date, the approaches and biomaterials used have not been widely successful. Options include using biologic approaches that attempt to regrow cells or using synthetic materials that try to match the natural and organic properties of cartilage. A little more than a year ago, DSM invested in a company called Regentis Biomaterials, which developed a promising technology for cartilage repair. The Company's technology is comprised of an in situ forming hydrogel based on fibrinogen and polyethyleneglycol (PEG). The hydrogel is designed to match the cartilage tissue biomechanically. Regentis has demonstrated in preclinical studies that over time, the hydrogel is replaced by cartilage tissue rather than non-functional fibrous tissue. Regentis has begun human clinical trials in Europe and clinicians and patients are anxiously awaiting the study results. Aging populations and active lifestyles lead to an increase in bone-related diseases and bone fractures. As a result, there is a growth in the use of and demand for bone graft substitutes. Today the 'gold standard' is still autologous bone, but this requires a second surgery or intervention that leads to morbidity (e.g., pain, infection) at the extraction site. The use of bone growth factors has demonstrated that the harvesting of autologous bone can be circumvented. However, there have been many reports that describe how bone growth factors come with additional risks if not properly used. Calcium phosphate-based synthetic bone graft substitutes (injectable or implantable) provide a good alternative. DSM, with a leading position in calcium phosphate technology as well as collagen and ECM technologies, is well positioned to further develop these options. MPMN: In my previous interview with your colleague Marc Hendriks, he mentioned Dyneema Purity fiber, which your company has billed as the "world's strongest medical fiber." How widely has this material thus far been adopted in orthopedic devices and how do you envision its use in orthopedics in the future? Fuller: DSM and Dyneema Purity fiber's position in the orthopedic device market is growing rapidly. 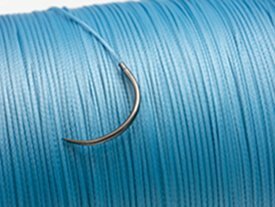 Dyneema Purity fiber is used by major medical device companies such as J&J, Arthrex, and Biomet. It is primarily used in high strength sutures used in rotator cuff repairs, fixation devices for ACL repair, and spine devices ranging from annulus repair to total disc replacement. Moving into the future, Dyneema Purity fiber will continue to be used in ligament fixations where the material's very low stretch results in a rigid fixation can improve the chance for faster re-adhesion of torn ligaments back to the bone. Beyond the orthopedics segment, Dyneema Purity fiber is also found in the reinforcement of vascular balloon catheters and is increasingly moving into other cardiovascular applications. MPMN: DSM uses the term "three generations of biomaterials." Could you summarize how these developments specifically apply to the orthopedic space? Fuller: Initially, biomedical materials were chosen for use in the body based on achieving a suitable combination of physical properties that matched those of the replaced tissue and created a biopassive, minimal toxic response in the host. In orthopedics, this type of first-generation biomaterials thinking is best seen in total artificial joints. Knee and hip replacements stand out as clinical successes as there are over one million performed annually, resulting in improved quality-of-life and a return to a more active lifestyle for many patients. An important focus for innovation in first-generation biomaterials is enabling minimally invasive surgical implantation. This forces stringent requirements on biomedical materials, leading to some recent advances such as DSM's Dyneema Purity fibers. UHMWPE fibers are helping to move implants beyond the limitations of more-traditional orthopedic fibers and sutures. Conventional fibers such as polyesters, polypropylene or nylon have a moderate strength and will show a fairly large stretch (elongation) before they ultimately break. The UHMWPE fibers are the opposite: Their strength is much higher, on weight basis the fibers are more than 10 times stronger than steel and a braid or suture made from these fibers has the potential to be twice as strong as a comparable polyester product. At the same time, the elongation is hardly noticeable. When these fibers reach breaking strength elongation is approximately 3%. These characteristics enable the design of novel, smaller medical devices. Increased understanding of the pathophysiology of implanted devices at the cell and molecular levels has moved the field of biomaterials to place more emphasis on improved management of a material's biointerface. Rather than trying to exclusively achieve a bioinert tissue response, materials are developed so they can incorporate bioactive components into their own design. This helps to elicit controlled actions and reactions in a physiological environment. Prominent examples of these second-generation "bioactive" biomaterials in the orthopedic space include injectable or implantable synthetic bone graft substitutes. Third-generation biomaterials are being designed to stimulate specific cellular responses at the molecular level. In the orthopedics space, use of bone growth factors and platelet rich plasma therapies signal the beginning of a larger movement towards regenerative materials that help the body heal itself. Related contemporary understanding of the molecular and cell biology of tissue healing is incorporated into materials design. Molecular modifications of polymer systems elicit specific interactions with cell surface integrins, and direct cell proliferation, differentiation, and extracellular matrix production and organization. These third-generation 'bio-interactive' biomaterials stimulate regeneration of living tissues. With regards to biocompatibility, these biomaterials not only focus on doing no harm, but also are designed as elements of the treatment itself. Brian Buntz is the editor-in-chief of MPMN. Follow him on Twitter at @brian_buntz.